We wish you a Very Happy Holidays and an Excellent 2017! Our 2016 was filled with wonderful friends and lots of Adagio guests. Many of our cruising friends, old and new, kept us company throughout the year. And we especially enjoyed long visits with our old friends who make their home at Isle of Pines. 2016 started in New Zealand, with our time occupied by yacht maintenance in Whangarei – punctuated by some excellent Bay of Islands cruising. Six weeks in a Whangarei boatyard was not on our 2016 plan, but two sequential years of bad antifoul workmanship forced us into completely stripping all of our antifouling layers back to the original 2000 epoxy primers. Followed by expensive reapplication of all the antifouling we had just scraped off. Bummers, but this time done properly and properly documented by Port Whangarei. Take note all ye yachtsmen. Come June we were just tickled to have our friends Vanessa and Wayne join us for the New Zealand to New Caledonia passage. 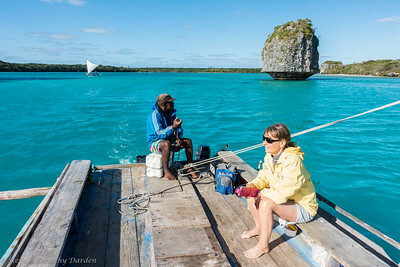 Besides having super-sailors aboard, we comprised a team of four photographers so we captured some splendid images, including Albatross, Green sea turtles, full moons, rainbows, crystal clear waters, sunrises, sunsets, traditional outrigger canoes, coral reefs, tropical fish, racing sailboats and more. Our next guest treat was our London friend Susie — who dedicated three weeks of her sabbatical to fly half-way around the world from London to spend July in the South Pacific. This was Susie’s second long visit aboard – and what fun we had! With Susie aboard we circumnavigated the Isle of Pines from Kuto to Oro to Gadji. 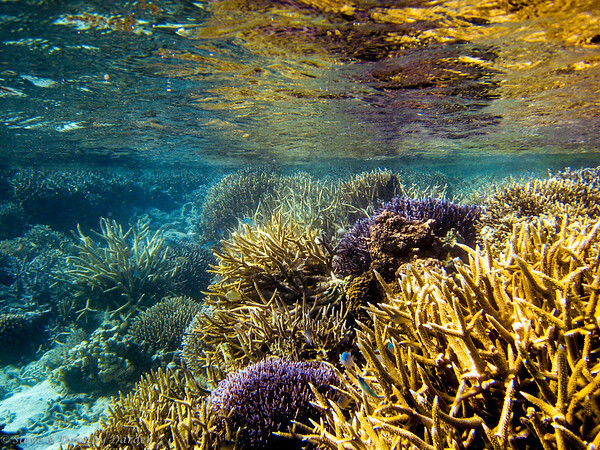 After resupply we enjoyed explorations of several special Southern Lagoon reefs. 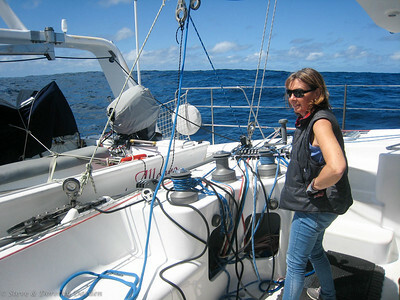 Susie gave us the motivation to get out there when the weather conditions allowed anchoring where there was zero protection from strong winds or seas. Just splendid! Come September, our daughter Kim managed to find ten days in her intense calendar to fly from San Francisco to the South Pacific. Prior to her arrival we had pre-positioned Adagio at Ile des Pins to ensure Kim had the best possible New Caledonia adventure. Once Kim was aboard we introduced her to some of our favorite people plus heaps of tramping around, traditional pirogue sailing, and of course snorkeling. It was way too short, but Kim did get a wee peek at what her adventuring parents are up to. Every day we extracted as much fun as we could think up. It was beyond intense! It’s now been four years since we left Australia in 2012 so we have heaps of Aussie friends to catch up with. 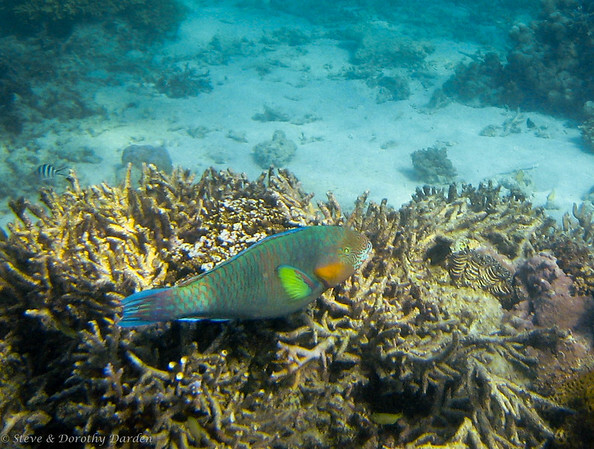 To start with we are making new friends on our first visit to Newcastle just 70nm north of Sydney (we didn’t know!). Later this week we are seeing potentially pleasant weather for a two-day sail down to Eden to prepare for our sixth crossing of Bass Strait. The very best thing we know to do in the southern summer is the Hobart Summer Festival and the AWBF (Australian Wooden Boat Festival). This year is even more special as two of our South Pacific cruising buddy boats have also arrived in Australia, and are also planning the Hobart Summer Festival and AWBF (French Canadian and French New Caledonian). Our next dispatch will be from our berth at the RYCT Royal Yacht Club Tasmania – sometime in January 2017. We don’t have the whole story yet but our dear friend Warwick ‘Commodore’ Tompkins got some horrible news from Hawaii on July 25th. Tropical Storm Darby moved through the Hawaiian Islands generating violent lightning storms. The night of the 24th Commodore’s Wylie 38+ Flashgirl was struck by lightning, damaging a galley sink thru hull fitting. When that happens to a lead-ballasted monohull the boat would normally sink. Fortunately their Kaneohe Bay friend David Nottage spotted the slowly flooding Flashgirl, quickly arranging to tow the yacht onto the mudflats. David organized high-capacity pumps to begin dewatering the boat when she was about 3/4 flooded. Hero Medal for David! Commodore and Nancy were on a motor yacht cruise in BC/Alaska when the news arrived from Kaneohe Bay early on July 25. They had to arrange for a float plane to transfer Commodore from the motor yacht to the airport. He connected in Juneau and arrived in Honolulu at 10pm that night to begin the salvage and restoration. From Warwick’s email situation report answering my question “How is Flashgirl? Restoration is our only option, which suits, because I would not survive long without the boat, and have no desire to “unburden myself”. Probably the better part of a year’s work ahead, and $50,000 US. We can’t do the rebuild for Warwick but we can help him get sailing sooner. Please send donations to the Paypal account FlashgirlFund@gmail.com that Nancy has just created. I just sent a contribution – it works. 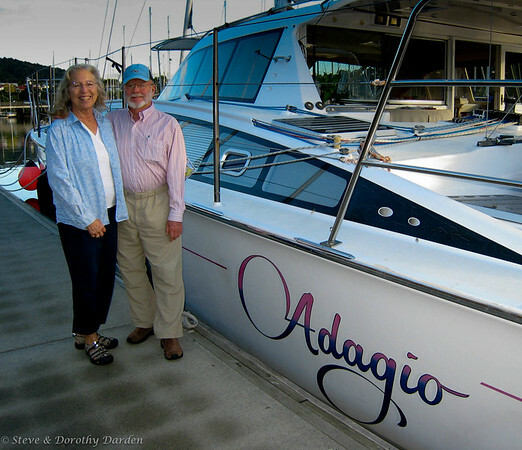 2012: We tried really hard to position ADAGIO so that Vanessa and Wayne could sail with us from NZ to New Caledonia, but a string of big Tasman Lows just didn’t want us to sail to NZ that May, how the weather herded us into sailing direct to Nouméa. 2016: Success! 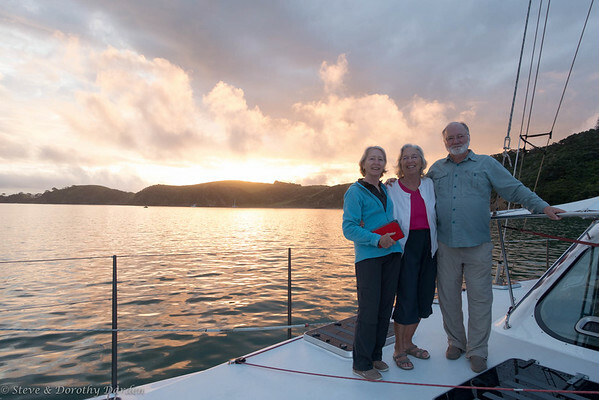 Vanessa and Wayne sailed with us from Opua on June 14th. June 14 departure weather situation: The color shading indicates GFS modeled significant wave heights as per the scale on the right, the arrows are modeled wave direction. 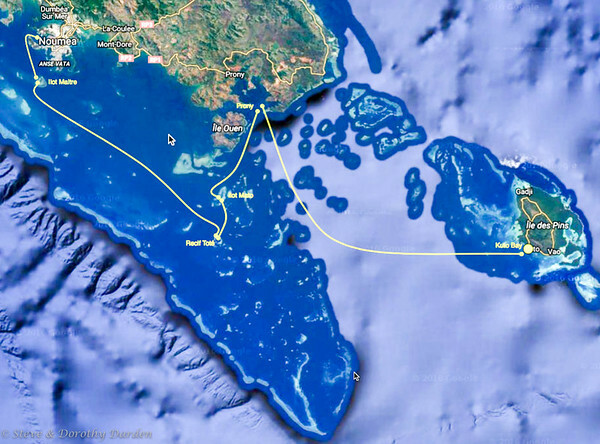 Mostly rhumbline to Noumea as comfortable course allows. Apparent Wind Angle: Mostly all aft of the beam. Less jibing than previously thought due to wind direction more consistently SSEward. Significant wave heights: to 3.5 m, mixed direction from SSW and SE trade wind wave and swell. Day 1: Departed Opua at 10:45. The local dolphins were at another party, so they sent a small pod of Orcas to farewell Vanessa as we sailed out to sea, on a 1000 nm passage from New Zealand to New Caledonia. Sunset displays the first night did not disappoint, and the cameras were active. We made 187 nm the first 24 hours. Day 3: Full moon passages are our favorite kind, making the night watches a pleasure. The reflection from the moonlight casts a bright streak from the horizon to the boat, rippling and sparkling in the night as it comes. We furled the reacher in 26-knot squalls, and started the engines for a while. 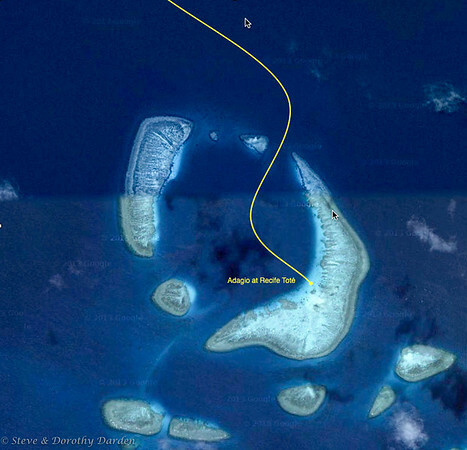 Distance sailed on day three was 185 nm. Several ships had passed us, and been tracked on our AIS. 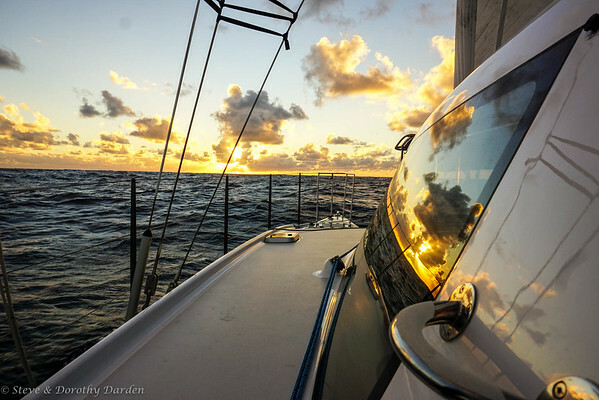 Steve’s log entry was, “Crew has all showered and after breakfast is sunning in the cockpit with e-books.” Distance sailed on day four was 193 nm. Day 5: Winds are in the 20’s, and we are fighting a 1.5kn contrary current for most of the day, making for a bit of a rolly ride. At 1042 am sharp-eyed Vanessa spotted the loom of Pic Nga mountain on Isle of Pines. Wayne landed a beautiful MahiMahi, and we dined on sashimi for lunch. 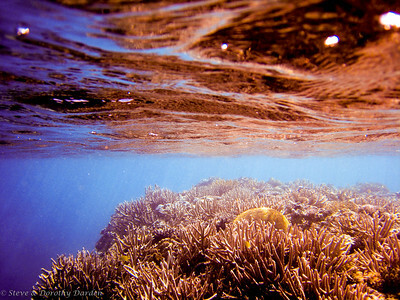 After checking in at Noumea, we headed out to give Vanessa and Wayne some time snorkeling in several marine reserves in the Southern Lagoon. 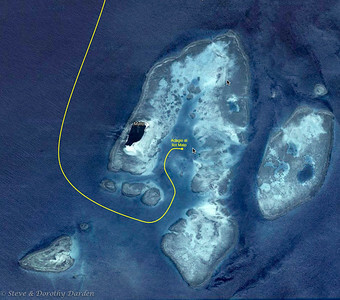 Ilôt Maître is a great place for abundant tropical fish, and occasionally a Dugong. Ilôt Signal brought more fish and quite a few sharks. Vanessa and Wayne certainly did soak up as many of the sun’s rays as they possibly could, before returning to wintry New Zealand. Thank you for the fine passage and the good times. We included a photo of TYSTIE that we took in Canada, to thank David for his help. The race was plagued with light winds, so a short course was sailed. We had good views, enjoying lunch and a waterside table at The Gables, a favorite Russell restaurant. 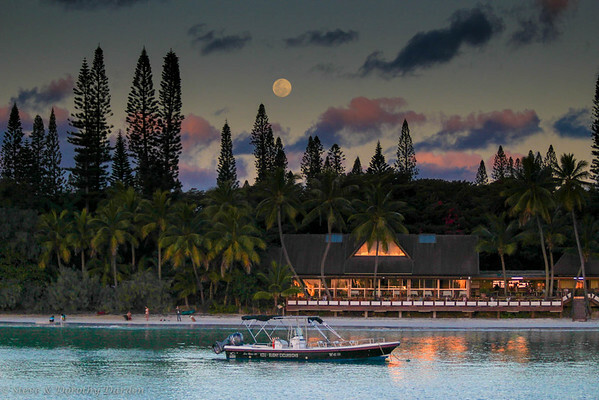 In the evening the Russell Boating Club put on a Hangi, a pit-cooked feast in the Polynesian tradition. It was a grand day out. We hope your year has been as full of friends, family, good food, adventures, good fun, sunsets and lovely scenery as ours has. Our earlier dispatches describe and illustrate our 2015, including ADAGIO’s 15 year refit, visits from friends and family, and our passages between New Zealand to New Caledonia. During all of our adventures, our family in California were having their own. Our grandson David graduated from high school and entered Bard College in New York. He took along his cello to continue playing beautiful music. Granddaughter Sarah, who is now a freshman in high school, continued to excel in horse jumping and dressage. She earned money to buy a Monofin and has aroused the interest of swimming coaches to help her develop her technique. Her new business of animal minding is going gangbusters in her neighborhood. How fortunate we are to have such a fine life, wonderful family and friends, good health and our lovely ADAGIO. May the New Year bring you your favorite things, places, friends, family and experiences. 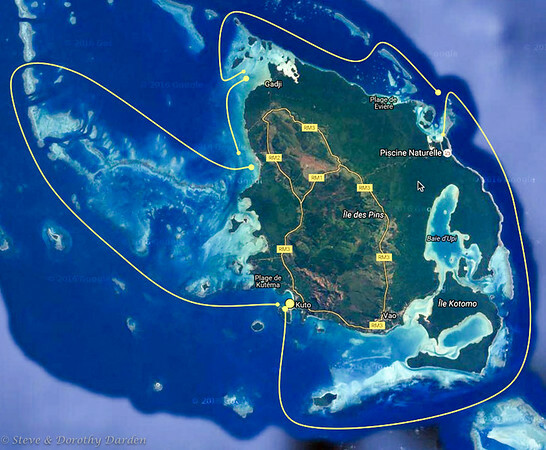 On the 16th of November, Dorothy’s sister, Margaret, and her husband, Fred, flew from Colorado to join us in the Isle of Pines, New Caledonia. 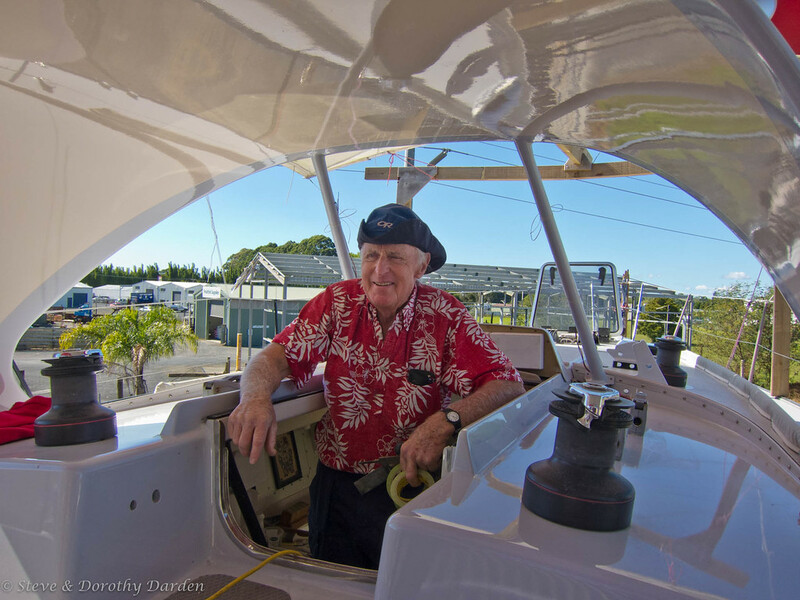 Making an ocean passage had long been on Fred’s Bucket List. As soon as they arrived, we began looking for a weather window for sailing to New Zealand. We wanted a “Goldilocks” window, not too early in the season, and not too late to risk playing tag with tropical cyclones. We were keen to “show them the ropes”, in preparation for the blue water passage. Planning this passage back in September with our router Rick Shema, Rick’s recommendation for this year was a passage towards the end of December. However, with two passengers aboard who had tickets to fly out of New Zealand on Christmas eve, we had to be sure we didn’t find ourselves facing only bad weather options and wishing we had taken an earlier “so so” weather situation. So when Rick reported that we would have a decent weather situation on the 23rd we decided to sail to Noumea for departure formalities. After a week of making the most of being in Isle of Pines, we enjoyed a lovely off-the-wind sail through the southern reefs. We anchored near Noumea just nine hours after departing Ile des Pins at 0555. Tuesday morning Steve cycled from one government office to another to complete our outbound clearance. Provisions and fuel were taken aboard, life jackets were tested, ADAGIO was fitted out for sea, systems tested, and we sailed for New Zealand on midday Monday the 23rd. ADAGIO’s guest cabin is portside-forward over the wing. Very comfy on our normal off-the-wind passages. 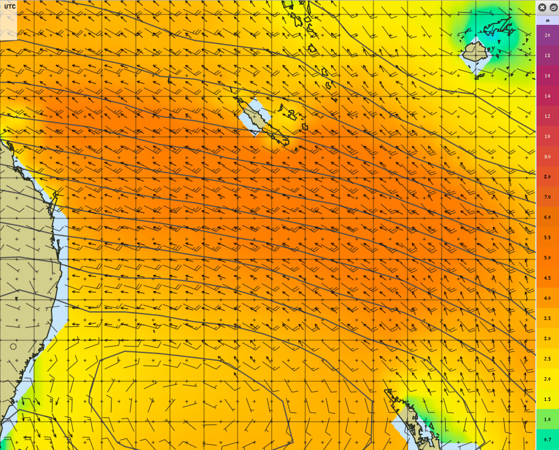 In typical Kiwi understatement, it’s a “bit bumpy” when we have to sail mostly upwind. While that’s what we had most of the way to NZ, there were no complaints from our hardy crew – though there was a bit of off-watch sleeping in ADAGIO’s saloon. With four aboard we could run a relaxing 2-on, 6-off watch schedule to NZ. Two hours on watch at the helm/navigation station, followed by six hours off watch, gave each of us plenty of time to rest, to read, watch Albatrosses, Shearwaters and Petrels circling the boat, starry nights, sunrises and sunsets, and to enjoy each other’s company. At dawn on our sixth day out, we spotted the “Long White Cloud” floating above New Zealand. 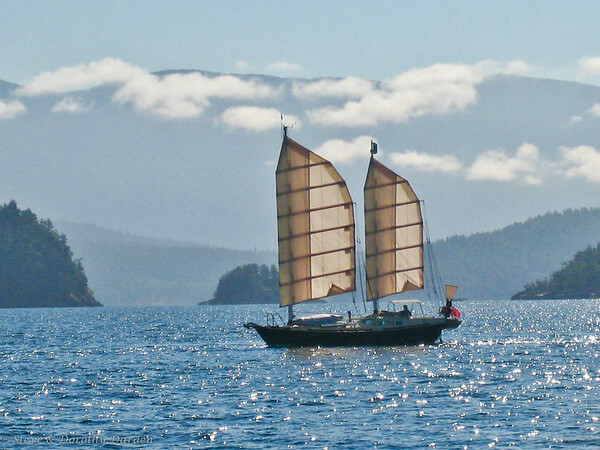 Sailing south along the coast of the North Island is a beautiful experience. Australasian gannets and Terns dived around ADAGIO as we entered the Bay of Islands. NZ officials set a very high standard for yacht formalities. As always they politely and efficiently checked us in to New Zealand at OPUA port of entry. In September we had celebrated our fifteenth year of cruising, and now we had returned to where ADAGIO had been built and launched in year 2000. We soon encountered cruising friends we had made years ago, and were eager to hear stories about their recent years of cruising. 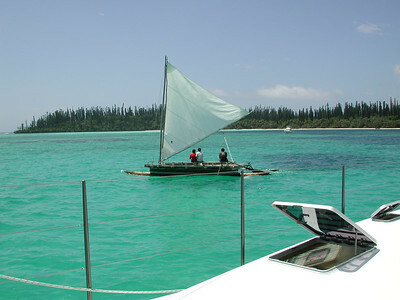 New friends we had made in New Caledonia continued to arrive, as well as cruisers from Vanuatu, Fiji and Tonga. Margaret and Fred joined us exploring around the Bay of islands: for hikes, beach walks, climbs to lookouts and native forest walks. Being recently retired, they were loving the life that we live, waking each morning, not really knowing the adventures and beauty that we would enjoy during the day, and meeting the interesting people who somehow always turned up. We were surrounded by such beautiful scenery that Margaret and Dorothy turned ADAGIO’s cockpit into a watercolor studio.